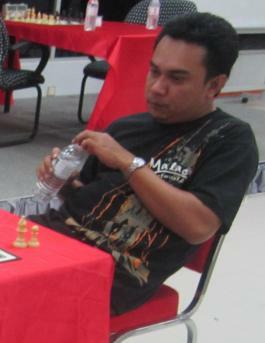 The UPSI Chess Open is one of GiLoCatur's favourite local chess tournaments. As far as GiLoCatur remembers the tourney is normally being held in the month of October. Its first edition began in 2007. So, this year it will be the sixth edition. For those not in the know, UPSI is a Malay acronym for Universiti Pendidikan Sultan Idris or in English, Sultan Idris Education University. The university is situated in Tanjong Malim town which is famous for its PAU. GiLoCatur strongly believes all the Malaysian readers know what PAU is. But how about foreign visitors? GiLoCatur just learnt that PAU is BAOZI in English. Interesting eh! Please visit Mr Wikipedia here to learn what baozi or pau is. Back to the UPSI Chess Open, why it is a favourite tournament for GiLoCatur. The answer is simply due to its time control or format. It has longer time control compared to the common one-day rapid chess tourney. It is either 45-minute or 60-minute per player. It has been a tradition that the chess tournament is held for two days. GiLoCatur had attended three editions - 2008, 2009 and 2011, out of its total five. The first edition was a miss because GiLoCatur was yet in the Malaysian chess scene. While neither GiLoCatur nor the kids took part in its fourth edition in 2010 since GiLoCatur and wife went to Mecca to perform the pilgrimage. Not only both Fikri and Anis took part in the UPSI open that year, but also did GiLoCatur. The tourney was held on 25th and 26th of October. While Fikri and Anis participated in the Under 12 section, GiLoCatur who was just rated at 939 at that time played in the Open category. GiLoCatur's best game in the 2nd edition that year was in the fourth round against Sahir Sarifdin of 17ChessClub who was about 700 points higher in the national ratings. Click here if you want to know what was the score accumulated by GiLoCatur. Below is the complete game. GiLoCatur did not participate in the 3rd edition in 2009. GiLoCatur just focussed on blogging and monitoring the kids' games. Fahim made his debut appearance that year in the UPSI Open. 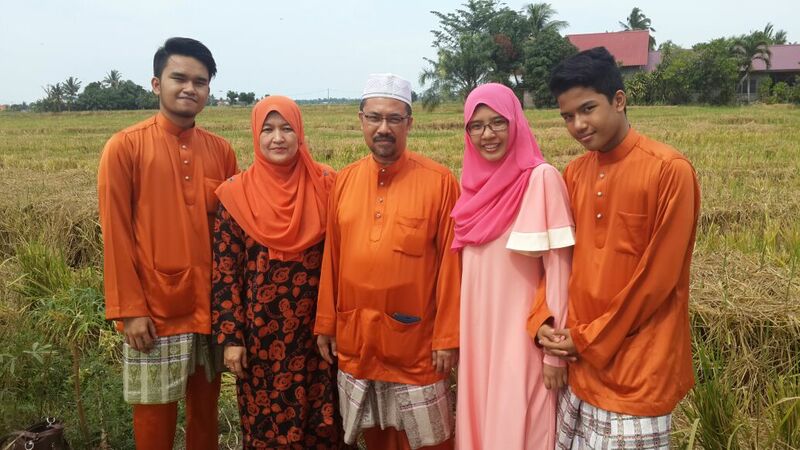 He joined his elder sister, Anis, in the Primary School (Under 12) category. Meanwhile, Fikri who turned 13th in that year was playing in the Secondary School category. Unlike his younger sister and brother, Fikri made to the podium receiving his winning prizes. The score of all the three GiLoCatur's children in the 2009 edition could be found here. GiLoCatur could still remember that Fireyrook had snapped few photos of GiLoCatur wearing new GiLoCatur shirt. Check out the photo gallery here and here of the third UPSI Open. GiLoCatur could not bear not to participate in the 5th edition last year. After not playing for two editions i.e. 3rd and 4th, GiLoCatur who had improved from 900+ to 1400+ in the national ratings joined more than 100 participants in the Open category as well as Fikri, GiLoCatur's eldest child. What was GiLoCatur's performance in the tournament? Who were the champions in that 5th edition? Check it out! Here and Here. It will be the 6th edition of the UPSI Open this year. The chess competition will kick off in about three weeks from now. The time control as per its flyer is 60-minute-per player of seven SWISS rounds. Unfortunately and most probably, GiLoCatur and the kids will not take part this year. The kids have to concentrate on their final exams during the period. GiLoCatur has been waiting for the tourney since last year. But what to do. GiLoCatur has to give more priority to the kids' academic. But GiLoCatur believes many other Malaysian chess players will take part, right? For further details on the 6th UPSI Chess Open, please visit this fb link. 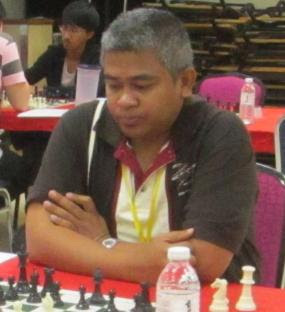 KL Open or its long name, DYTM Raja Nazrin Shah International Open Chess Championship, will kick off this morning at 9 o'clock. None of GiLoCatur's children take part like last year where GiLoCatur's daughter took part. Based on the pairings of Round 1 here, 82 players including ten (10) Grand Masters (GM) will take part in the tournament. GiLoCatur would like to wish "Good Luck" to all the participants especially the following two chess buddies. SALUTE TO ALL THE TWENTY (27) MALAYSIANS WHO DARE TO TAKE PART IN THE TOURNAMENT! It is several minutes to midnight in Malaysia. It is near to 7 o'clock in Istanbul, Turkey. It is a very suspense moment watching the match between Malaysia and its ASEAN neighbour, Philippine. The score is now 1.5 point each. 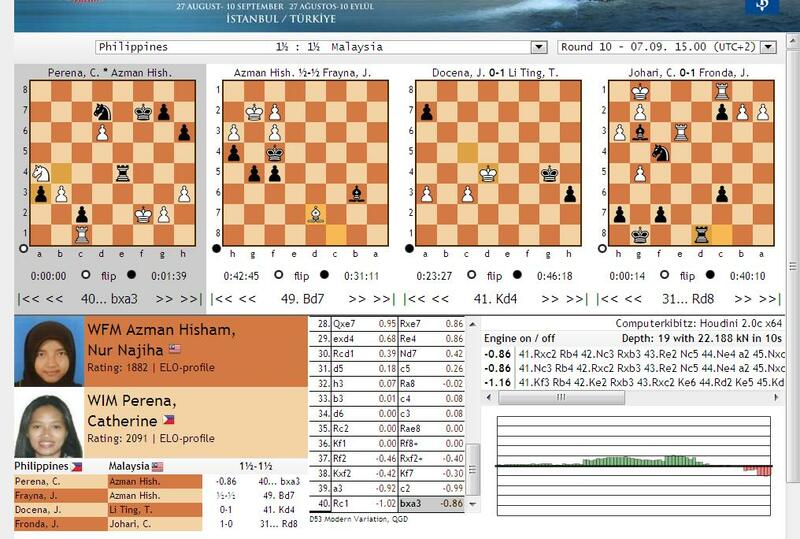 Malaysia was trailing 0.5 to 1.5 point when Camilia lost to her higher-rated opponent and Nabila drew on board 2. Thank god, Li Ting provided the important one point to equalize. Now, Malaysia is depending on its first board player, Najiha. Her win will make Malaysia and its chess community happy and joyous. Her defeat will make Malaysia lost the match to the Philippines. If she draws, both countries will share the match point. What it is gonna be? GO Najiha GO! It is 1.10 am o'clock right now. GiLoCatur is still awake following the Malaysian teams playing the eighth round. In the women section, Malaysia is paired against Bosnia & Herzegovina (BIH) at table number 26. On paper, Malaysia has lower chance to win the match since its ranking is much lower than its opponent. Malaysia is ranked 83rd while Bosnia & Herzegovina is the 39th seed. But with the spirit of "Malaysia Boleh", Najiha, Nabila, Li Ting and Camilia had made Malaysia proud by winning over their opponents 3 to 1. Playing on board 4, Camilia made her 200-ratings-higher opponent resign at move 26th. Her win gave Malaysia one important point. Malaysia was up 2 - 0 when later Najiha upset her WIM opponent. It is really a big win for her since she beats a 400-rating-higher opponent. GiLoCatur was confident that Najiha would win after 41st move she gained winning advantage. When Malaysia was up 2 - 0, a crucial half point would seal the victory for Malaysia. 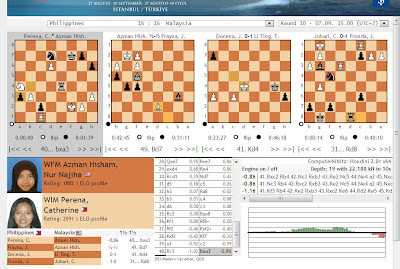 It was a suspense moment whether both Nabila and Li Ting could at least draw against their respective opponent. Then Nabila who also played on board 2 in the 39th Moscow Chess Olympiad made sure that Malaysia won when she drew with her WFM opponent, Aleksandra Dimitrijevic. Li Ting made the victory for the Malaysian women squad sweeter when she also drew with her rated-at-2066 WFM opponent, Dijana Dengler. It was an excellent performance indeed. GiLoCatur wishes that the Malaysian electronic and print media write about this. 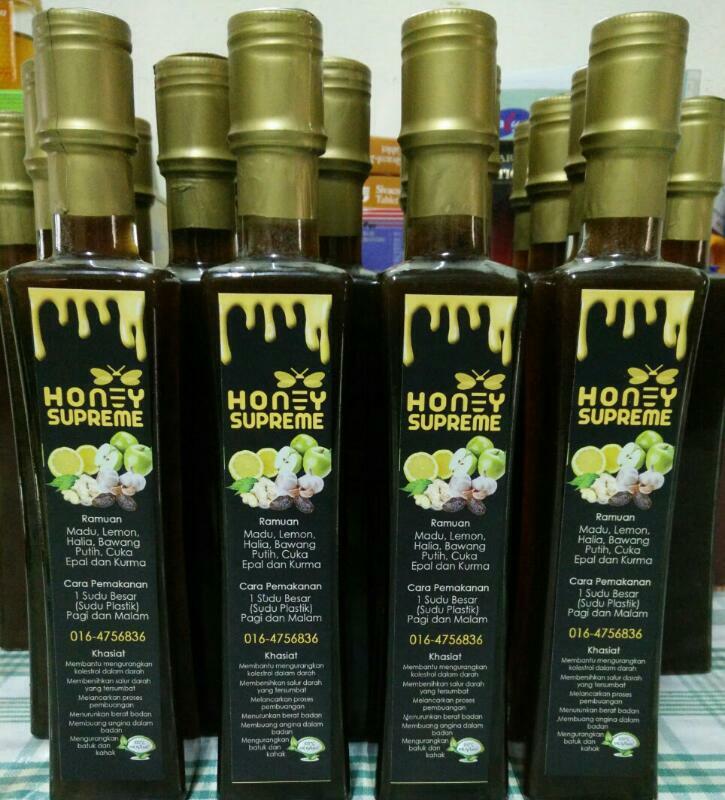 Syabas & tahniah! Keep it up. It was a double joy for Malaysia since its men's team had thrashed Libya with 3.5 - 1 score. Enjoy ten photos below that GiLoCatur snapped during the MMU International Chess Open that just concluded. Ahmad Fadzil just came back from Portugal after participating in the World University Chess Championship a week ago. His performance is quite commendable when he scored one win, six draws and two defeats to collect 4/9 points. Click here to see further. GiLoCatur just arrived home less than two hours ago after participating in the MMU International Chess Open or its abbreviation, ICO. To those who do not know what MMU means, MMU stands for Multi Media University. GiLoCatur and the kids were among 64 participants who took part in the two-day chess tournament held at its Malacca (Melaka) campus. Actually, it is the third time that GiLoCatur and the kids played in the MMU ICO. Who emerged top of the table? Who are the participants besides GiLoCatur and the kids? Check out below final ranking.